Here’s the truth about food blogging (and indeed any blogging); it’s not as easy or as glamourous as one might think. Take this post for instance. This is one of our favourite all-in-one meals. It’s not something we make a lot because it’s a bit time consuming, but it’s something we really, really enjoy. We couldn’t wait to share our version on the blog. But, here’s the thing: we didn’t know what to write about it. It’s true. Yes, food blogging is all about the food, but it’s also about the story. Food bloggers don’t just make delicious food, take some photos, and then share the recipe with their fans. They also craft a story. That in itself can be a challenge, especially when all you want to tell people is: Try this recipe! It’s fantastic! By now, (and if you’ve read our about section), you know that my wife, Mae, writes these blog posts. Wait? You thought I wrote them?! Nope. I simply provide the inspiration for the voice behind all our blog posts. I also read and, ahem, approve each and every post. I mean it is written from my point of view, and besides, my wife wants me to think that I have a super important job. Well, actually I do. We couldn’t do this blog without each other, and of course, without you. Yes, there’s food to photograph and taste-test. There’s also photographs to edit, brand and upload to the site. So, I guess I do have a pretty important job. I mean can you really have a food blog without photos? Fun side story: we thought you could have a successful food blog without photos when we first started out. Seriously, here’s our very first recipe post from May of 2014. Yeah, we’re not sure what we were thinking either… we all know that people eat with their eyes. But back to the trouble with this blog post. My wife just couldn’t think of how to present this recipe. Seriously, it was really really bugging her. Just sit down and write, she kept telling herself… but all that seemed to appear on the screen before her was the words: Get Stuffed. How cliché is that phrase for stuffed peppers, she’d silently shoot back at the monitor. Yep, it’s true. Food blogging (or serious food blogging anyway) is not an easy gig. It takes creativity , patience, initiative, and time – a whole lot of your time. And sometimes, like any writers, food bloggers get hit with a serious case of writers’ block. That’s what happened to my wife. Since she’s been writing in one form or another pretty much all her life, she knew that it would pass. In the world of blogging though, your audience expects posts quickly and routinely. So even though we intended on having two posts last week, it didn’t happen. The beauty of running your own food blog, and being your own boss, is that you can change the rules when need be. So, about these peppers. Why do we like them? They’re just fun to make, and to eat. There’s something very cool about taking food, stuffing it with other food, and then devouring it as if it was its own new food entirely. Well, I guess it kinda is. 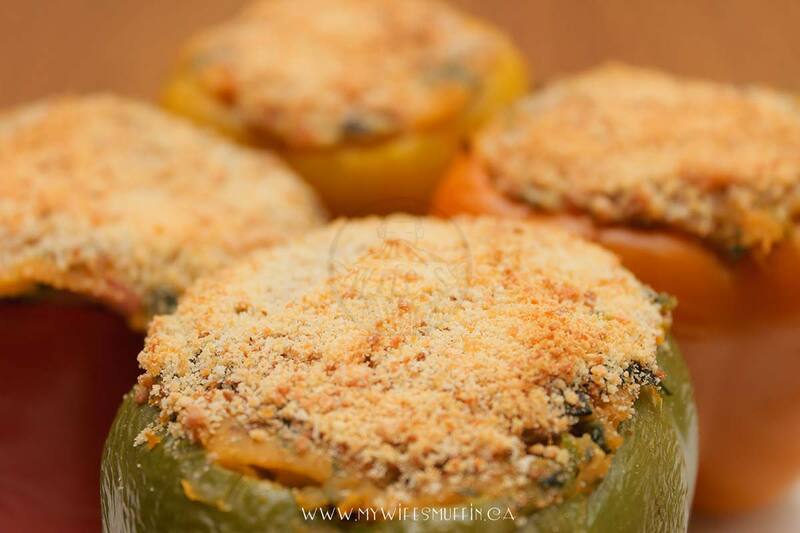 Stuffed peppers are so much fun because you can use a variety of starches and grains, like mashed potatoes, rice, quinoa, and cous-cous with your choice of meats and vegetables to easily please even the most discerning eaters at your table. Of course, there’s one other thing that makes it a bit more challenging for us to craft our blog posts: coming up with very punny names. We’ve been doing it since the beginning, and we see it as in integral part of our brand. It’s not always easy to come up with something clever though. Luckily, for this recipe, the name came to us before we even started planning it out. 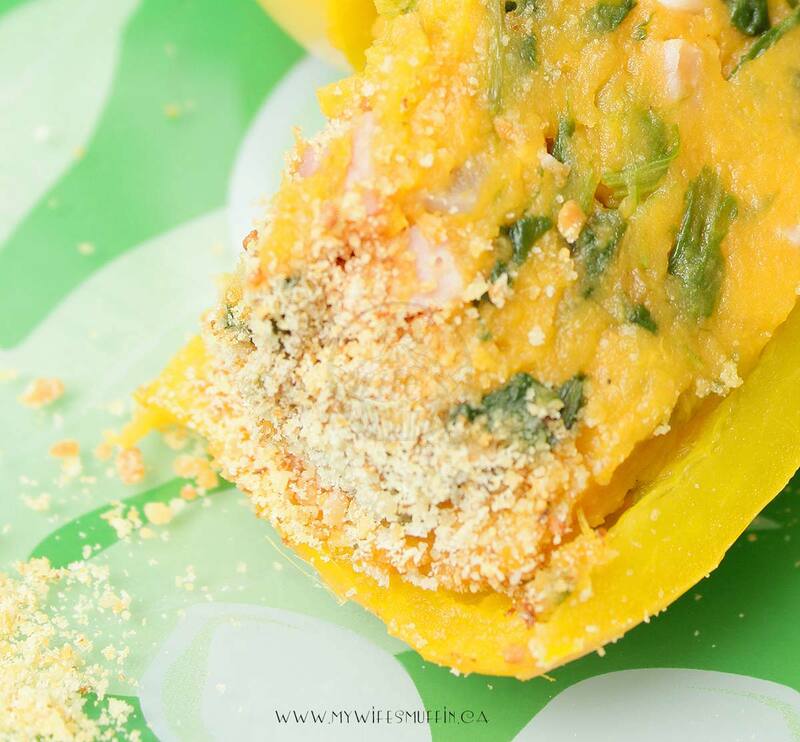 I Yam What I Ham Stuffed Peppers seemed like the perfect name for our fun and healthy creations, particularly since we added a little spinach and olive oil to the mix. This meal is sure to make you strong to the ‘finich’! Peel and dice yams. Boil until tender (approximately 20 minutes). Mash yams with 2 tablespoons of butter and 2 tablespoons of milk until a nice whipped texture is achieved. Set aside. In a small skillet, cook onions and garlic with olive oil until onions are translucent. Set aside. Prepare spinach and ham, if not previously done. Set aside. 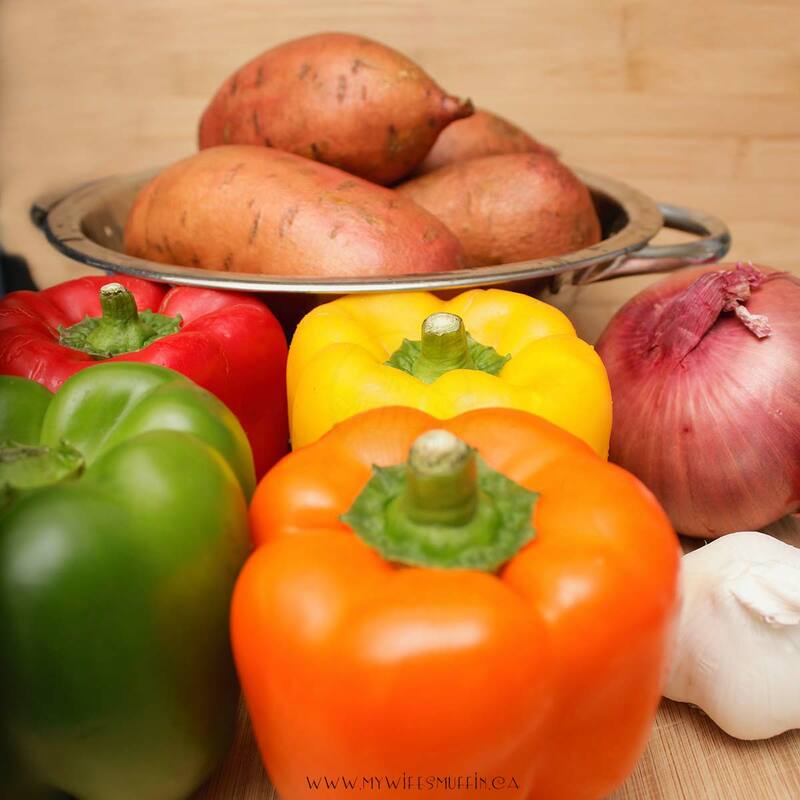 Remove stems, cores and seeds from peppers. Be sure not to cut into the sides of the peppers. The only opening you want is the top part of the pepper removed. Rinse and pat dry with paper towel. In a large bowl, mix together yams, spinach, onions, garlic, ham, salt and pepper until thoroughly combined. Scoop generous amounts of yam-ham mixture into pepper cavities. Keep adding mixture until it fills the entire pepper. Repeat process for remaining peppers. Top with breadcrumbs/shredded cheese and bake upright in preheated oven at 350 degrees for approximately 1 hour. Video, Popeye: Let’s Sing with Popeye is in the public domain.